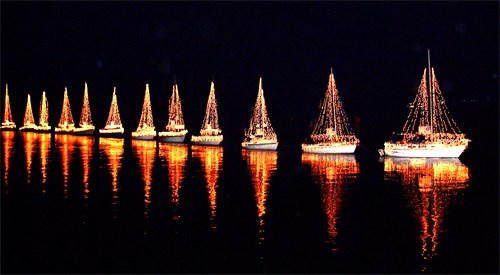 The Annual Boat Parade of Lights is in its 36th year and has been the must-see event of the holiday season. Lake Havasu City's Boat Parade of Lights has been repeatedly selected as one of the top 100 events in the U.S. by the American Bus Association. Up to 50 boats brightly decorated in their holiday best will delight children and adults alike. Watch the boats cruise through the Bridgewater Channel beginning in Thompson Bay and continuing under the London Bridge to the north end of the Channel, with a turnaround at Windsor Beachand back. Bundle up and take a stroll through the Channel – the only time you’ll see the Channel packed full of boats and boaters in winter gear at night. Come cozy up with family and friends and create treasured memories of a favorite holiday tradition!